Observe – Practice – Speak! There are many options to observe speakers, on and off-line. 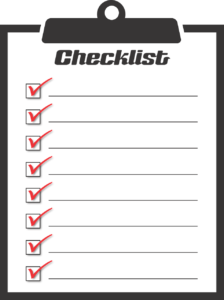 Regularly, take advantage of as many of them as possible. If you’re in the audience of a live presentation you are given a better perspective than just watching video or listening to a speech. It’s tough to beat a live performance and the reactions of others in attendance gives additional interpretations of the performance! 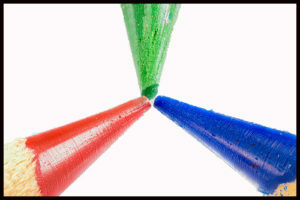 Look with a critical eye and listen with a critical ear to the content and delivery. 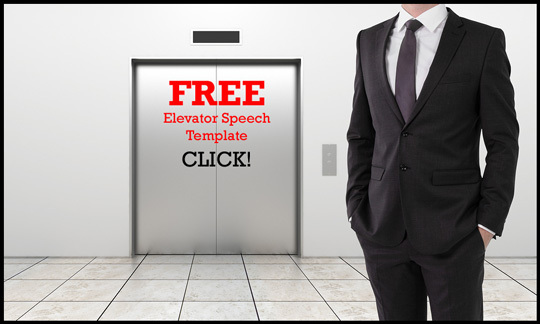 What do you like and want to incorporate in your own speeches? Prioritize those things, looking at ease of emulating, and the impact they will have on your audience. What do you find distracting, irrelevant to the message, or annoying? Are you doing any of those things? 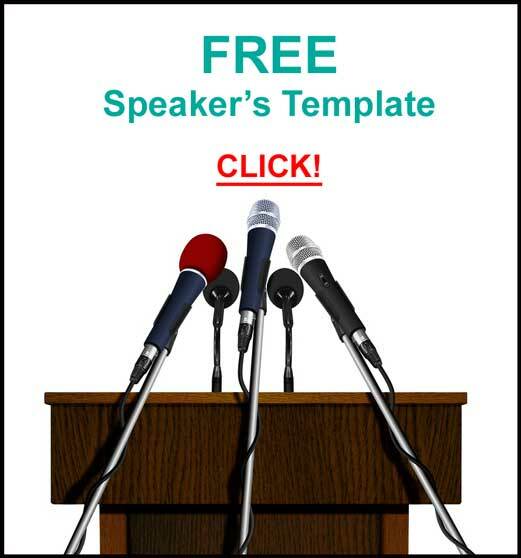 Practicing your presentation is not optional. Practice with an audio recorder. 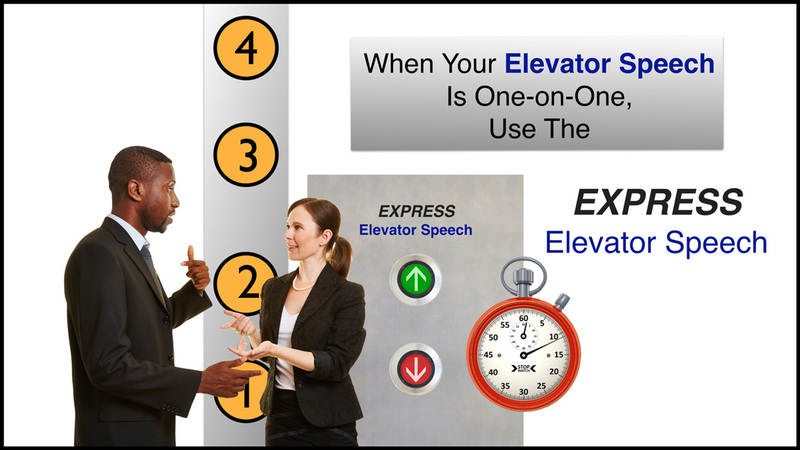 Note enunciation and pronunciation, cadence, inflection, projection, and pauses. 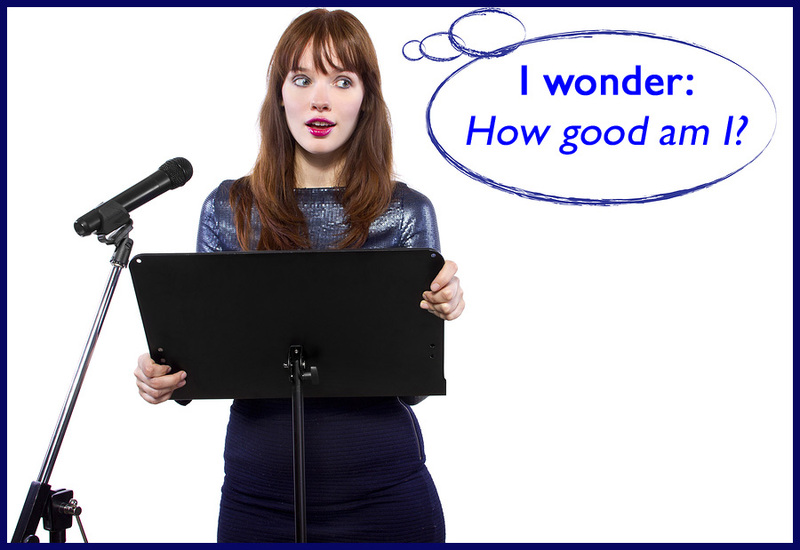 Are you using any “filler” words that distract from your talk? “Ah” “Um” “Like” “So” “You know” and others should be replaced with a: P-a-u-s-e.
“See” yourself comfortable and confidently presenting. “See” the audience “leaning in,” and GETTING IT! The First Time you use that video, turn off the sound – just watch. Nonverbal communication trumps verbal. We believe what we see. What messages are you receiving from your gestures, facial expressions, posture, and body movements? The Second Time you use it, don’t watch – just listen. You will hear things that you would’ve heard if you were watching. Maybe some “ahs,” “errs,” “smack, smack, smack.” Things like that. Perhaps you use filler words that are distractions. Third Time – watch and listen! There’s a Fourth Thing to do. Get someone to watch and listen with you. We all have blind spots. We can’t see and hear everything the audience will see and hear. Get their advice. Then, repeat. Take that great advice – do the video, again. Practice – Practice – Practice. Video it. The Learning is in the Doing! If you want to be a great swimmer – Swim! 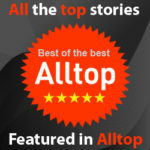 If you want to be a superb chef – Cook! 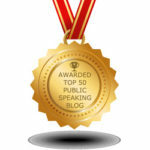 If you want to be a excellent speaker – Speak! You can watch videos, observe other speakers, read about presentations, and practice – practice – practice. That’s all good, but . 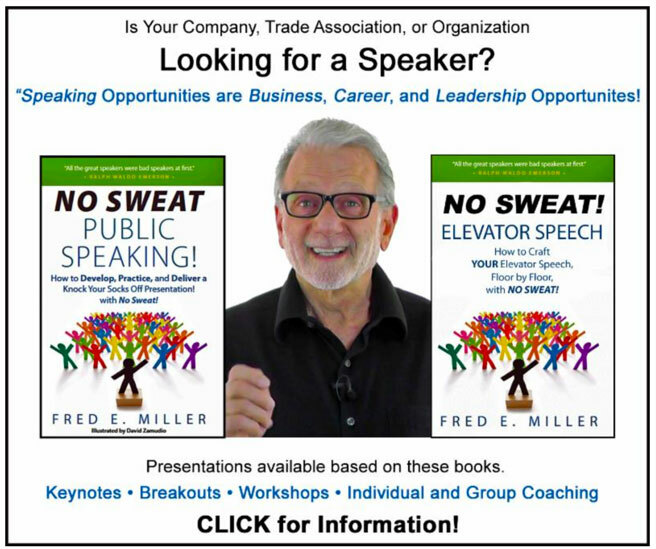 . .
Take and Make as many “Speaking Opportunities!” as you can. Speak at associations and clubs you belong to. Speak at Meetups, Chambers of Commerce, and other networking events. 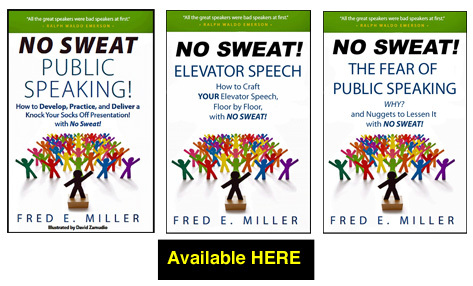 Do that and I guarantee – your next presentation will be absolutely, positively – NO SWEAT! Thank you so much Fred for your superb advise on presentations. My presentation skills have improved. Fred, thank you very much for this nice and good article. These are all great tips!